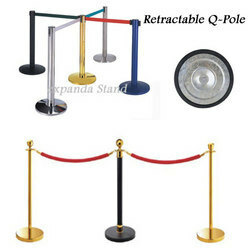 Our clients can avail from us a wide range of Que-Poles. Manufactured with high grade stainless steel material, these are provided with retractable belt & can be used to form 3-way or 4 way queues. Que-Poles provide the most economical way of implementing crowd control & customer flow management. It is manufactured with high-grade stainless steel material & imported retractable belt components. These queue poles are available in various finishes such as chrome, zinc, gold colored finish powder coating.